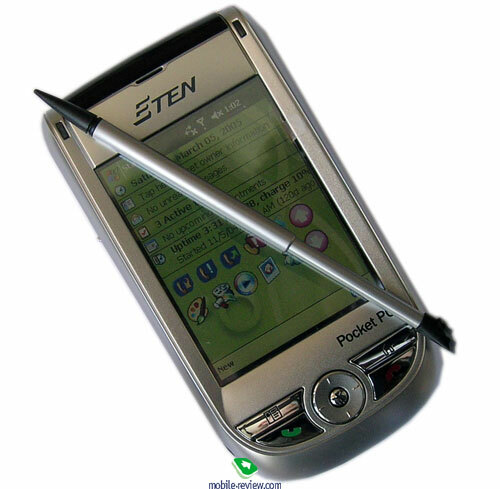 The Taiwanese company E-Ten specializes in development and production of Windows Mobile smartphones. It belongs to the second echelon of smartphone makers. 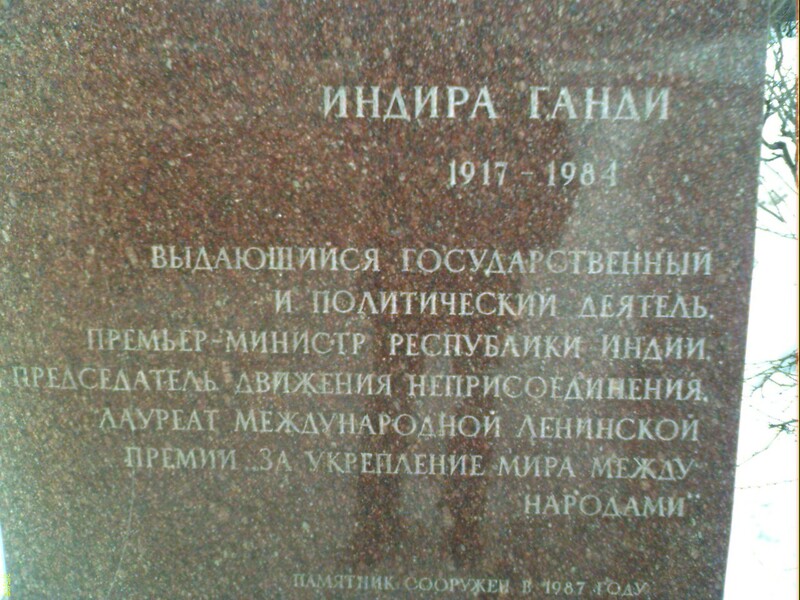 Let's recall the products released since the company's foundation. 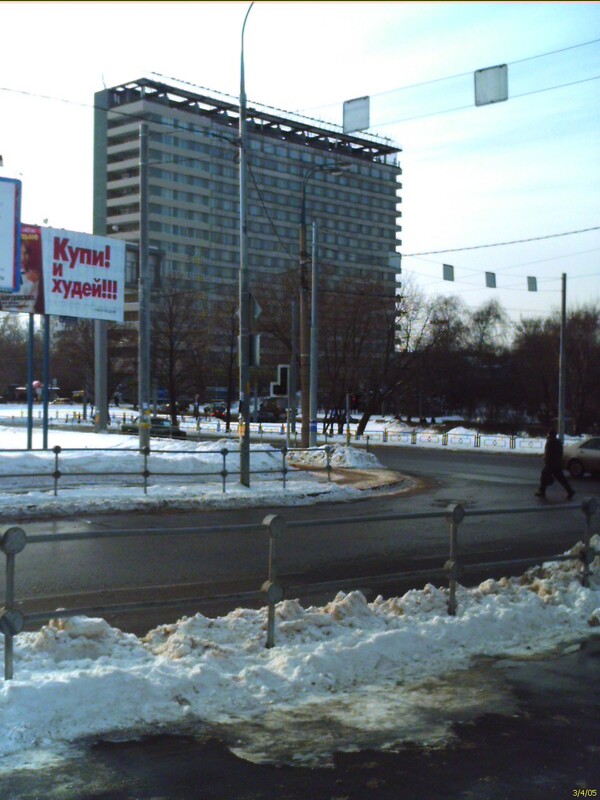 The first devices (E-Ten P600, E-Ten P603) created the image of brick devices with poor functionality. 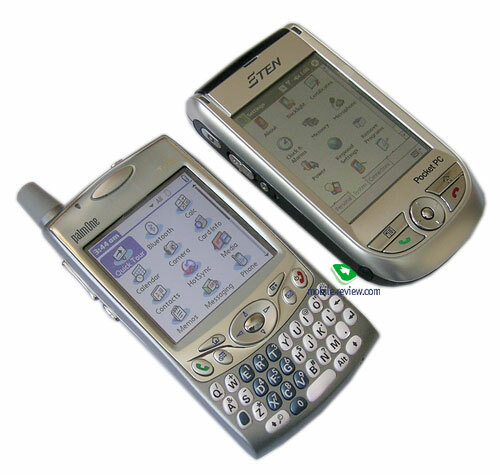 This was the idea of Windows-powered communicators at that time (late 2002 - early 2003, the Pocket PC 2002 era). Then there was a slightly stricter E-Ten P700, however it kept large dimensions and poor functionality (just a single slot, no Bluetooth). 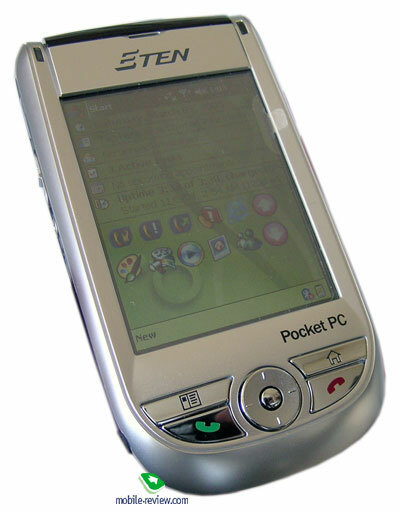 Later there appeared E-Ten P300 (followed by the version with Bluetooth - E-Ten P300BT), the company positioned it as the smallest Pocket PC smartphone, and that was really true. But the model featured a poor (STN) screen, the quality of plastic and assembly didn't stand up to criticism, there were some crucial hardware and software defects (numerous bugs, complaints of users, returns). The release of E-Ten M500 implies an effort to correct the mistakes, to make a competitive product, which could join the competition with the makers of the advanced echelon. The company has succeeded to do it in part, and failed in part. The key rivals of E-Ten M500 are modifications of HTC Magician platform (Qtek s100, I-mate JAM and others). In our review we will hardly skip the comparison of both models. The M500 lags behind HTC Magician by (half) a step almost every time when we compare them (larger dimensions, lower assembly quality and so on). We'll analyze all in details in this review. I'd note that the company speaks up about itself with its E-Ten M500, despite of all the defects. The company keeps great potential, we should pay attention to it (it's not in vain that the company was present in a prestigious phone booth at CeBIT 2005). I'd break the usual sequence of the review and start with the sales package. It's filled with maximum stuff. We take out a cradle from a beautiful box. The cradle is made like a plate and looks stylish. There is a socket to charge a spare battery. The USB plug at back is meant for PC connection only, we plugged some USB peripherals, but it didn't work, the PDA didn't see them. The carrying case produced negative impression on me at first - some technological trash poured out of it and soiled the device (I'd advise you to vacuum the case before use). However I liked it after I cleaned it and used it for a week - comfortable binding, magnet rivets. The only remark is that you can accidentally press the buttons while ejecting the smartphone, so you'd better activate hold function. 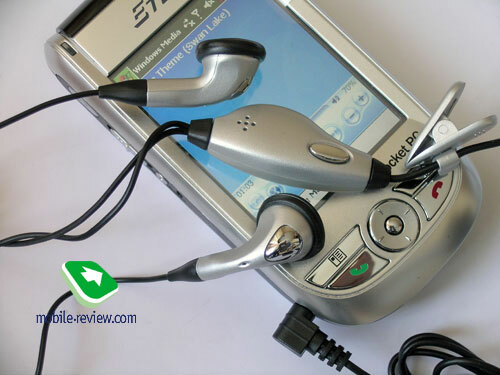 The stereo headset represents ordinary small headphones. They reproduce good MP3 sound (as well as in many Pocket PCs of today). You can use your own headphones with an adapter (additionally supplied). The design isn't bad. It resembles smooth edging of HP iPaq 1940 somehow (the front bottom). In all, the device looks more artificial than HTC Magician. The latter is too simple. However some of you might argue with this point of view. Well, I do repeat that the design choice is much individual. The assembly quality of E-Ten M500 is noticeably worse compared to HTC Magician. Its silver plastic feels in hand the very way plastic should, so you won't mix it up with metal. The shell joints aren't always even, not tightly fixed. That is the assembly quality is definitely worse. 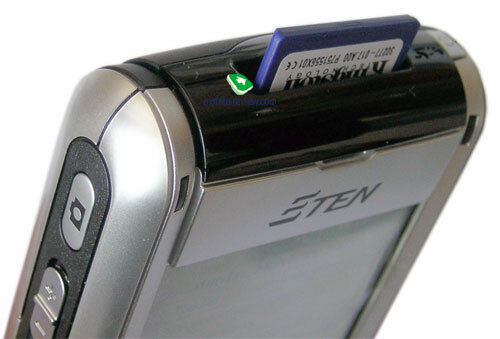 The thickness of E-Ten M500 is at the same level with Asus MyPal P505 and Sony Ericsson p900, however the flip adds the thickness of Asus and SE models. 170 grams of weight don't make crucial difference against HTC Magician, when you carry the device in a pocket of a jacket or trousers, coat. The control elements of the front panel represent a classical set of Pocket PC control elements. There are a 5D-pad and 4 buttons. The joystick is small, it's not comfortable in gaming, especially the central button (you have to arch you finger and press the button with your nail), however it's possible to get used to it. Two indicators are placed above the screen: Bluetooth - to the left, GSM networking - to the right. The left side is crowded with the following elements: a camera button, a sound volume slider, a voice control button. I'd say in advance that the voice control system is completely similar with that in Asus P505. With an exterior utility you can assign other functions to the sound volume slider, for example, page scrolling up and down. There is also a reset hole, you should tap it with the stylus-pen. At the bottom we see a synchronization connector and a mic, nothing else. The silo is located at the bottom, between back and bottom parts of the PDA. There is a telescopic stylus, it stretches out to a long pen. Thus it is comfortable in work. At the top there is nothing surprising - an infrared port, a slot for memory cards and Power button (it's not comfortable, but you hardly press it accidentally). I'd mark the common defect of the hardware buttons. In our sample all hardware buttons just got switched off very often, only a soft reset helped in such situations. At the back panel you find a camera eye, a self-portrait mirror, a flash (almost useless, it isn't effective over a 20 cm distance). The camera interface deserves some praise, it is well thought out, well visualized, there is great variety of settings and shooting modes. The quality of its 1.3-megapixel camera doesn't stand out from the line. 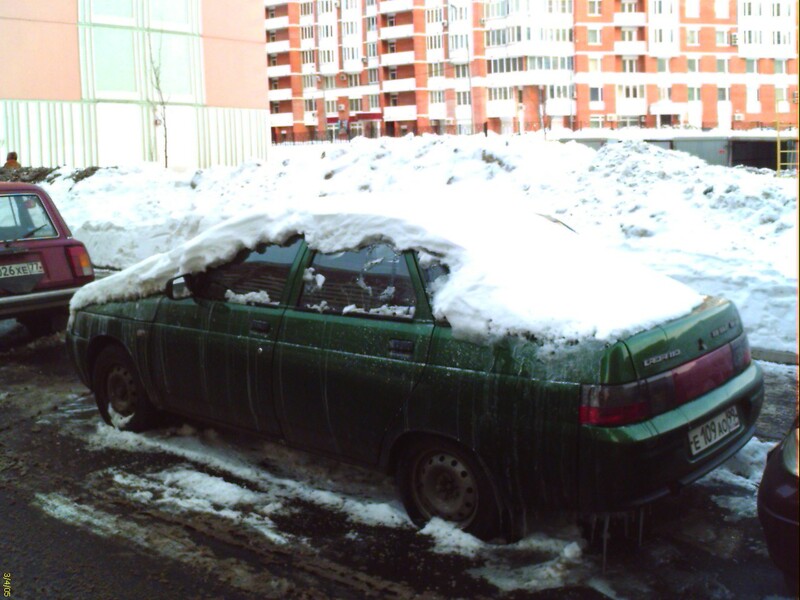 If you snap photos under bright daylight, the images get too bright, for example, sky or snow has white color without half-tones. 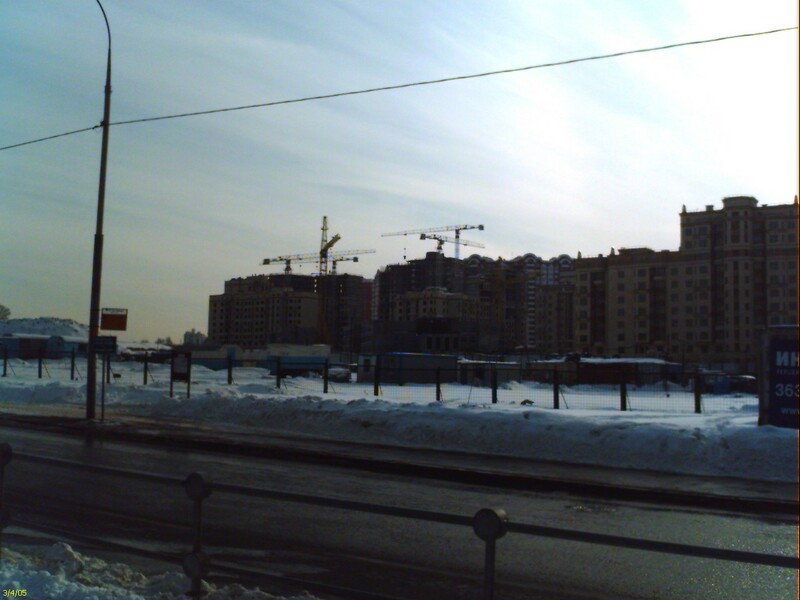 You can receive good photos outdoors within an average distance, when the sunlight isn't direct, but dispersed. With its specs and quality this screen is a standard one for a mid or budget Pocket PC - this is a transflective 320x240x65K colors TFT matrix. 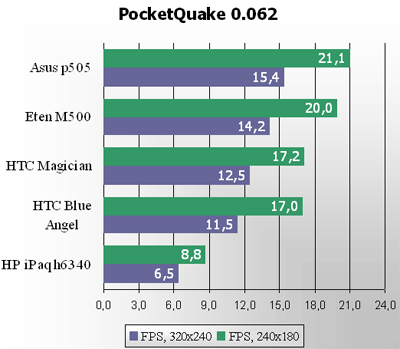 If we compare it with Asus MyPal P505 or HTC Magician, we can hardly say whether it is better or worse. These are models of the same level. 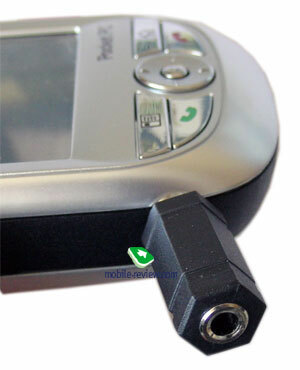 Gradually the screen with a 2.8-3" diagonal instead of a 3.5" becomes a norm for Pocket PC communicators. Following the release of a new operating system Windows Mobile the average diagonal will be 2.5" long. 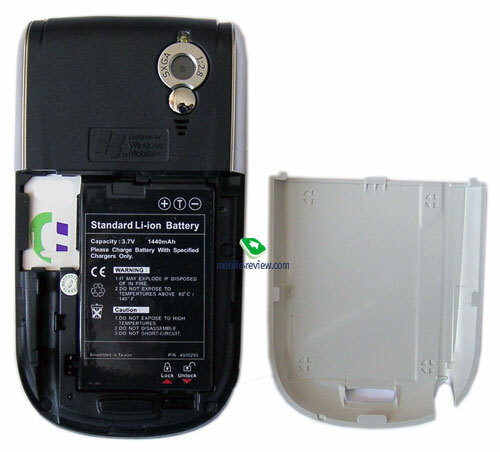 E-Ten M500 carries a Li-Ion 1440 mAh battery onboard. The device lasted for 1.5 days being used for 2 hours as the organizer, an hour of GPRS, 25 minutes of talks. Under the same conditions HTC Magician worked for 2 days with a less capacious battery. If you use the device intensively, you'd better charge it once a day. As for the PDA mode (the phone and Bluetooth are off). Under the maximum load (video playback from the storage card, the lowest backlight) the communicator was good for 3 hours 50 minutes (here and farther the performance is better against HTC Magician due to larger battery capacity). In the MP3 player mode - almost 15 hours. The continuous reading of e-books on Pocket PC took 11 hours 30 minutes. 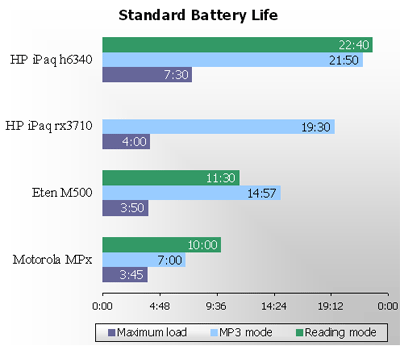 I'd note an interesting detail, HP iPaq rx3710 equipped with the same processor and battery of the same capacity worked longer in all modes, the fact is that the power consumption of E-Ten M500 is not optimized as it could have been. 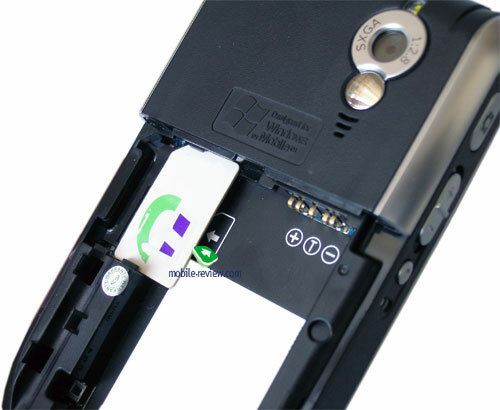 The SIM lock isn't standard, the card is placed to the left from the battery and is completely open in case the cover is removed, however you should first take out the battery to eject it. We'd faced a problem while locking the cover, it'll take you some effort to fix it at once. The implementation of integrated Bluetooth module needs a separate talk. Neither de facto standard Broadcom drivers, nor integrated stack by Microsoft are involved. Here we have own brand drivers. As a matter of fact it's a buildup for standard Microsoft drivers, i.e. the functionality is as poor, important settings and many other profiles aren't available. There is the following defect - Bluetooth happens to get switched off and won't be on. In this case only a hard reset can help. At CeBIT 2005 I discussed this defect with company's representatives and got the answer that the new ROM update no longer had it. I advise you to check Bluetooth efficiency when you buy the device. Taking into account the number of returns it's a mass problem. It is no problem to transfer contacts, meetings and files to the communicator, but it's impossible to send them from E-Ten M500. COM-port emulation and voice dialing via Bluetooth headset work correctly. Using standard settings you can assign an action to the headset button. There is the support of several simultaneous Bluetooth connections. First of all let's speak about RAM - there is 64 MB, 54.3 MB is available to the user. The flash memory available has 83.42 MB, that's not little. You can store several system back-ups and small programs. If there is an expansion slot, you shouldn't pay much attention to the internal memory available. 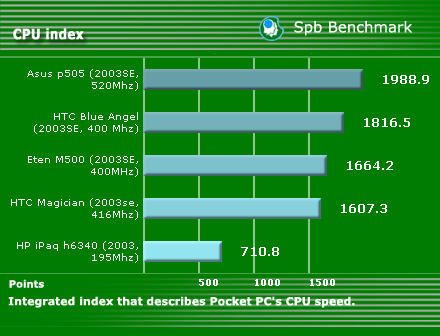 The CPU - Samsung S3C244A works at 400 MHz maximum. 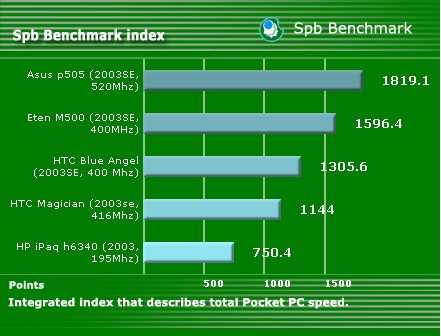 To test the processor productivity we've applied SPB Benchmark test package, and chosen actual Pocket PC communicators. 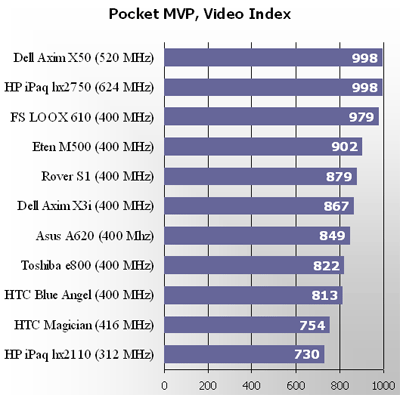 This index describes Pocket PC's CPU speed. 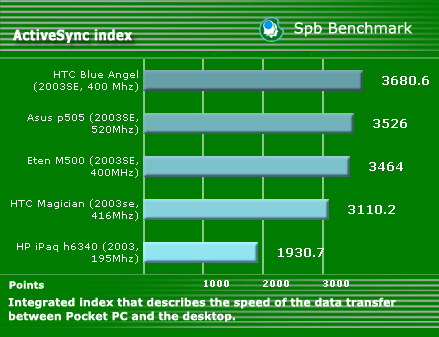 At a lower clock rate E-Ten M500 is slightly ahead of HTC Magician. 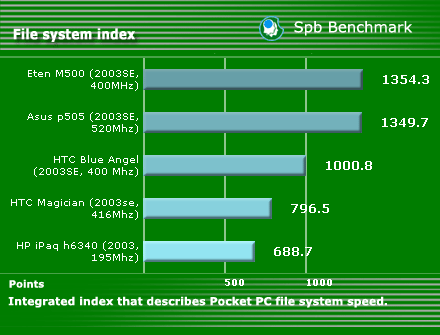 The file system index describes Pocket PC file system speed (read/record/move). The handheld bears the palm due to a more speedy external RAM bus. 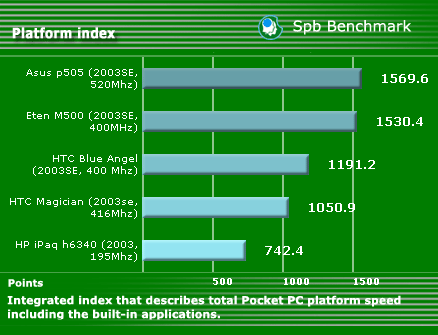 The platform index describes total Pocket PC platform speed including the built-in applications. The results of this test are similar to the previous test as total platform speed depends on file system speed. Here is a slight lag from Asus P505. 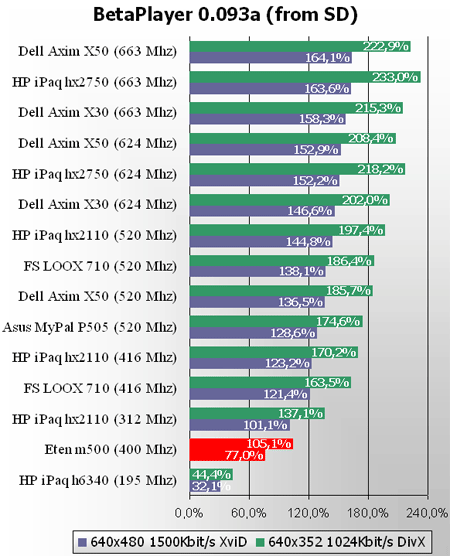 Integrated index describes total Pocket PC speed. E-Ten M500 performed well, it can be used to complete almost all tasks. Here is the graphics productivity test with PocketQuake game in the mute mode (turn the sound off by nosound 1 console command leaving other settings on). The smartphone showed good results and lost to the Asus model only. The video test. We launched several test clips at different intensity (kbps - kilobit per second, DivX 5.03 codec used). Sound got encoded in the mp3 format with 128 kbps bitrate. We applied the criteria of dropped frames while playing, the less the better and tested a fragment from the motion picture Cats and Dogs (the fight scene). The index was formed on the basis of dropped frames, the index 1000 meant that there were no dropped frames at all. The performance with BetaPlayer and without Wireless MMX acceleration (integrated into Intel XScale PXA27x kernel) turned to be low. The communicator can't be sped up. Well, in the end of the productivity test we can say that E-Ten M500 copes with any tasks, except for video playback without re-conversion, and resource-intensive games. 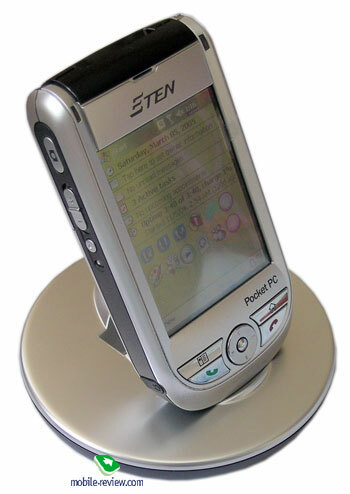 E-Ten M500 is powered by WM 2003 for Pocket PC Phone Edition, which is the very Windows Mobile 2003 for Pocket PC Second Edition (read about it in the respective review), but extended with several applications to manage phone functions. The set of exterior programs deserves lot of praise, it is focused mainly on the phone functionality. Let's speak about it in details. Voice Commander. This application adds voice control for the PDA, besides it works without training. 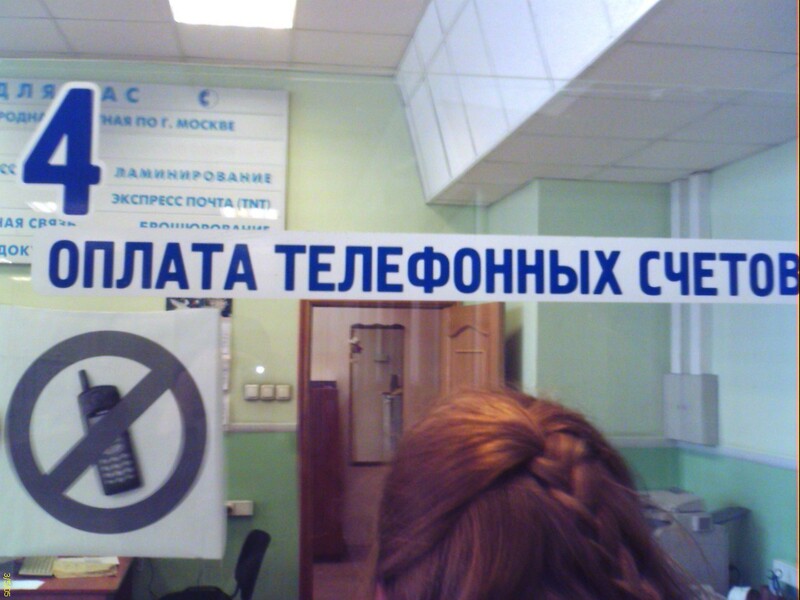 You can just pronounce the name or the phone number, the system will recognize the contact. If you are not satisfied with the recognition quality, you can record a voice tag. The same program is installed in Asus MyPal P505. CallFilter. Here you can specify white/black lists for contact numbers, and then choose the mode, whether to receive calls from the white list or decline calls from the black list, it's possible to disable it all and not to receive any calls. MMS Composer. 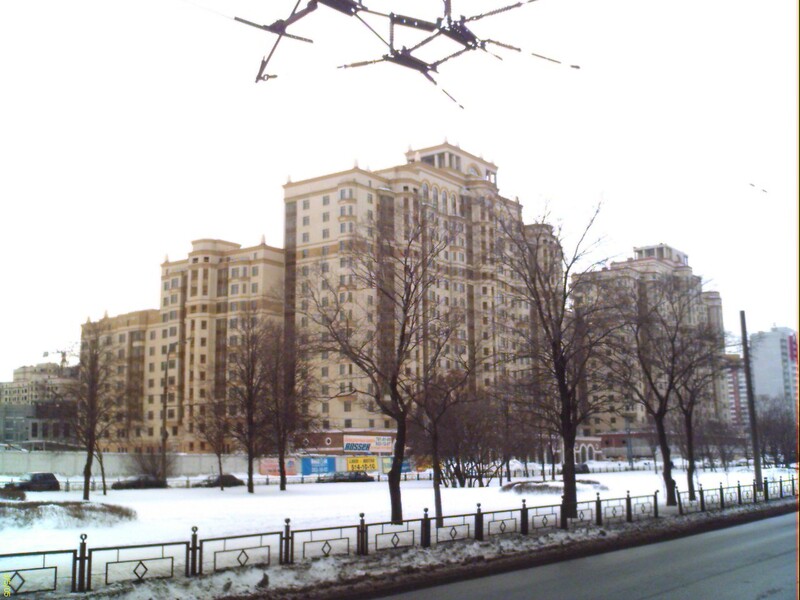 The utility composes MMS messages, easy in use. SIM Manager operates SIM card data, there is nothing special about it. SIM Tool Kit. It's an ordinary SIM menu. Frequency Dial. 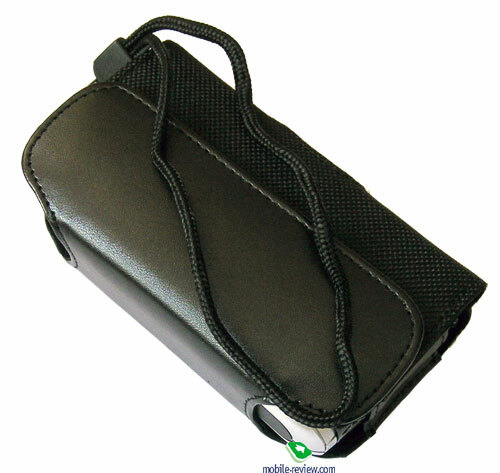 It's a very useful built-up for contacts, it displays recent 10 numbers. You feel it comfortable to press your finger to the big virtual contacts button to dial a certain number assigned to it. Wireless Modem. 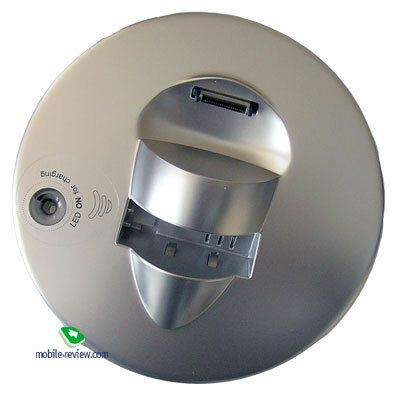 It's possible to use the communicator as a wireless modem, the PC connection is done via infrared port or Bluetooth. Backup Utility. This utility launches data backup. Format Flash Disk. Use this application to format Flash memory available to the user. Profiles. Here you can tune profiles, there are 4 of them. It involves sound volume, vibration alert settings, and backlight settings. The Start Up screen has some built-ups. Firstly, there is a battery charge indicator below the clock (none in the standard version). Secondly, there is the plug-in for a quick launch of applications and main settings, you can access it from the Start Up screen. 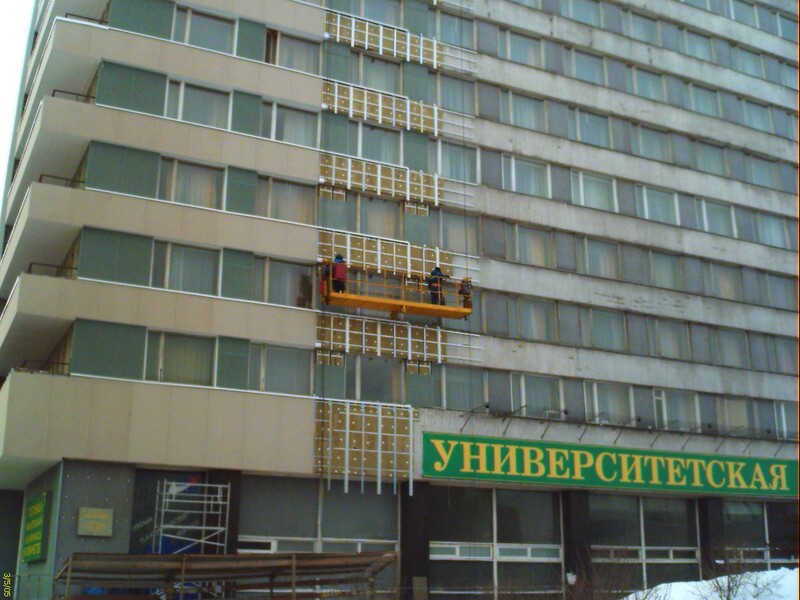 To say the truth, an exterior program SPB Pocket Plus can do the same. M-desk. Nice and functional alternative launcher. ImageMaker. This utility is of average functionality and designed for painting. Image Wizard prepares images for sending via MMS or e-mail. Multimedia Manager views images and runs slideshows. The network reception quality proved to be good. The vibration alert is of average strength, as for the sound volume, the M500 sounds louder than HTC Magician and you can hear it almost always. For a company of the second echelon of smartphone makers, the E-Ten M500 means an effort to correct the mistakes and to make a competitive product. It succeeded in part. Priced at $600 the device represents a cheaper analog of РЕС Magician models, though the price difference is almost negligible - $20-30, i.e. the price isn't a clear advantage of the E-Ten model. The assembly quality is worse compared to HTC Magician, the device is larger and heavier and shell materials are cheaper. With a more capacious battery the device lasts for less time in the phone mode against its main rival. The first ROM updates have some crucial defects - a spontaneous disconnection of Bluetooth and hardware buttons. The strong point of E-Ten M500 is with its productivity performance, however the target audience won't notice the difference. The battery life in the PDA mode is longer, but the power consumption isn't completely optimized. I'd focus on the sales package, which is richer than that of HTC Magician. 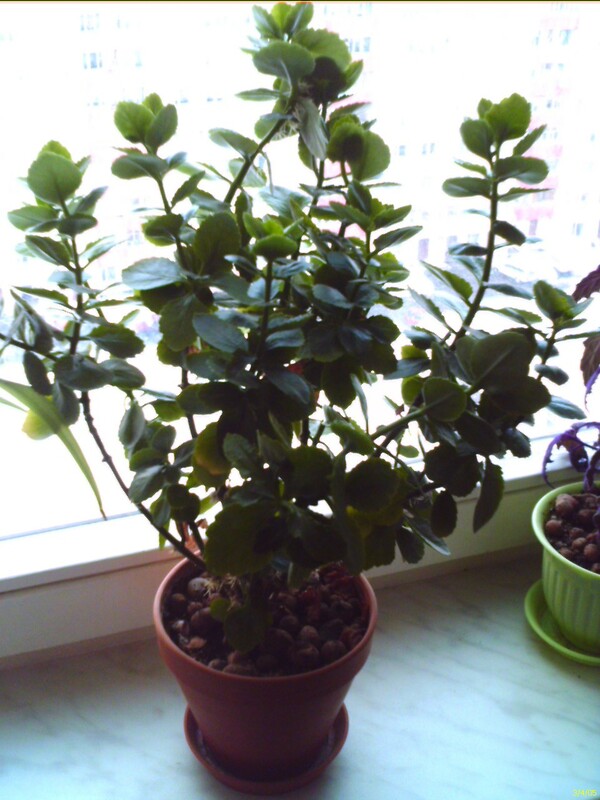 In all, it's a good product with its strong and weak points. It won't be a sales hit, but it'll find its customer. There are substantial improvements from the previous models released by the company.